I love companies that care about the environment which is why I am excited to introduce you Nimli. Nimli is an online marketplace that is devoted to providing natural, organic and sustainable products that embrace both style and aesthetic. So both ecologically sound and chic- I’m really liking this! Nimli was founded in New York City in 2003 by Rajat Arora, an advocate for organic living. This store has such a diverse selection and there are so many wonderful products to choose from. They carry clothing for men, women and children, fashion accessories, home decor, beauty products to name a few. 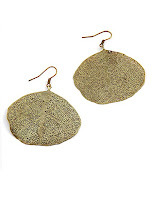 All of their product line comes from independent designers that are environmentally conscious. Something about Nimli that really stood out to me to show how much they care is their requirement that all designers ship their products directly to the customer thus eliminating the “middleman”. They have no need for adding that extra step of shipping to the warehouse, storing the products then shipping to the customer upon order. This greatly reduces their carbon footprint! Nimli sent me an Azuri Reversible Ombre Pashmina Shawl in Sky Blue and an Azuri Black Triangle Bamboo Bangle for review. The Pashmina Shawl is gorgeous! I loved the beautiful blue colour’s vibrancy and felt that it really brought out my eyes when I put it on. The shawl is made from 55% Pashmina and 45% Silk and its so soft. It has a fringed end which gives it a bit of a funky look which I like. It’s also surprisingly warm- not warm enough for a Canadian winter mind you- but for a Spring or Summer evening when it cools off, it would be great to wear. I’m looking forward to being able to wear this summer when we have a few weddings to go to. I think it will look really great with a cute dress. It’s also very versatile so that I could wear it when I wanted to “dress down” in jeans and a shirt. This product was originally priced at $170, but its on sale right now for $54! What an awesome sale! It is a bit pricey at full price, but the sale price is excellent in my opinion. The Azuri Black Triangle Bamboo Bangle is handwoven and has gorgeous black strands woven through the middle to create bold triangular shapes. Again, this bangle would look great with a dressy outfit if I was going out for dinner or to a wedding. I would also wear it with jeans and a black t-shirt too. It’s also a good size too and the design is also appealing. It’s priced at $20 which seems reasonable since it is a handwoven item made of bamboo.